Test knitters are expected to meet deadlines or communicate in advance if that is not possible. Test knitters should check in at least weekly to report progress, problems, or delays. More frequent check-ins are encouraged, especially if there are questions. 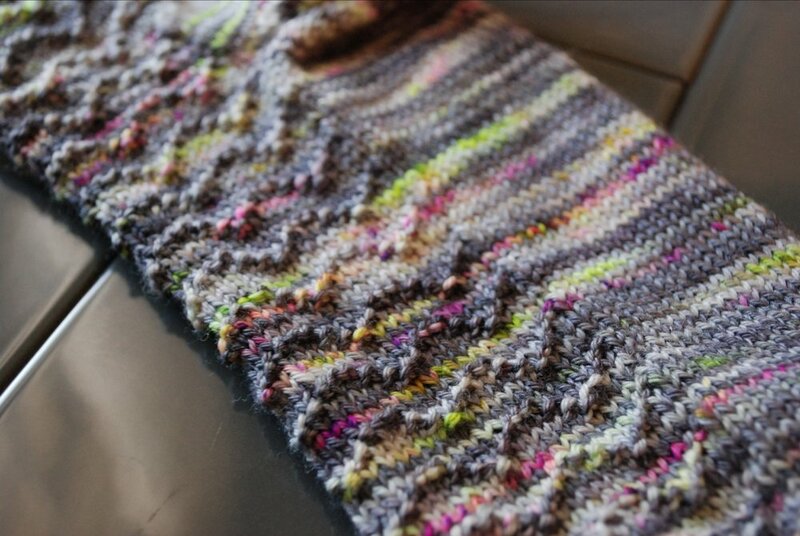 Test knitters should be willing to have a Ravelry project page, including photos, of their project. I always appreciate honest reviews, project details, and suggestions on those pages, or on the pattern page comments section. At this time, I am offering $20 in store credit, plus a final copy of the pattern to all testers who complete the testing process. It isn't compensation, but realizing that this is a lot of effort for $20, I do my best to respond promptly, be understanding of changing circumstances, and to provide a pattern that has been thoroughly edited. This pattern is for a pair of lightly textured socks, in 3 sizes. Intended Ease: There should be approximately 0.75 inches/2 cm negative ease in your sock. To achieve this, measure the widest point of your foot and choose a size that is approximately 0.75 inches/2cm smaller than that. Sample shown is size 7.25 inches/18.5cm with 0.75 inches/2cm of negative ease on model. I am looking for testers who can use sock yarn from independent yarn dyers, though that isn't a requirement. The socks are worked from the toe up, using your choice of sock needles. 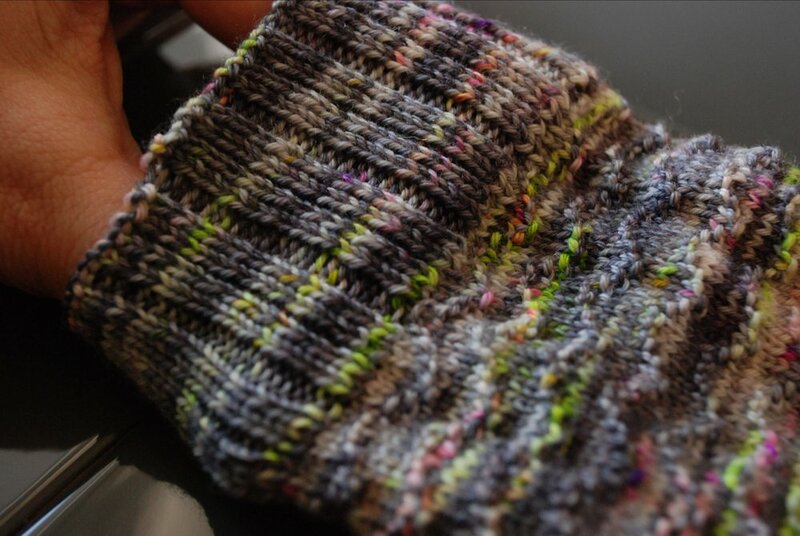 These socks use knit and purl stitch patterns, worked from either charted or written instructions. The Roll With It socks feature the Fish Lips Kiss Heel. This pattern is available as a separate Ravelry Download for $1. The pattern contains details on how long to make the foot of your sock, how to turn the sock heel to get a great fit, and has links to video tutorials that will make the short rows in the heel go off without a hitch on the first try. If you don’t already own this pattern, it is necessary to purchase it or choose a different heel type to complete your socks. Inexperienced testers are welcome and encouraged. Testers should have some knitting experience, but do not need to have experience with every technique in the pattern. Testers will need to communicate any questions they have regarding the pattern even if the answer seems obvious. One of the benefits of test knitting is to help me anticipate pattern questions and answer them within the pattern rather than addressing knitter questions later. I ask that test knitters make a note when they aren't certain what they should do next and then mention that to me. Knowing that test knitters are often experienced enough to figure out the answer to their questions testers can feel free to proceed as they think they should, or they can email me with questions and wait for answers. This pattern is self-published, so there is no need to be secretive about projects. I would appreciate you sharing the projects on social media using the #stackedwoolens tag and the #RollWithItSocks tag. To sign up for this test, please email me at stackedwoolens@gmail.com with the subject line Roll With It Socks Test. If you are interested in future test opportunities, please fill out the form below to be sure not to miss out on future tests. This pattern is a re-do of my original pattern, the Snowden Shawl. When originally published, this design was only for Bulky weight yarn, and the way it was written required some advanced knitting techniques that were cumbersome, to be honest. After 5 years, I have worked to reimagine the shawl, turning it into an any weight, any gauge crescent shaped shawl that is fun to knit and much simpler to make. Test knitters have the freedom to choose their yarn weight and make the shawl to the size that suits them. There is no need to match the pattern gauge; you simply choose a yarn you love, and work it into a fabric you love, then make a few decisions based on that. The Yarn Yardage Requirements chart will help you determine the yardage needed based on the size of the shawl you want and the yarn weight you choose. I am looking for testers who can use semi-solid to solid yarn preferably from independent yarn dyers, though that isn't a requirement. The shawl edging uses cabling techniques, worked from either charted or written instructions. The shawl body is shaped with garter stitch short rows. These should be attainable, even if you've not knit using short rows before. The pattern gives suggestions for shawls of two lengths in all weight of yarn, from lace to super bulky. This pattern is self-published, so there is no need to be secretive about projects. I would appreciate you sharing the projects on social media using the #stackedwoolens tag and the #SnowdenShawl tag. To sign up for this test, please email me at stackedwoolens@gmail.com with the subject line Snowden 2.0 Shawl Test. Thank you for signing up as a test knitter. You will receive an email message when new tests are announced, and you will have the opportunity to opt in or opt out.